Euro is facing the deflation threat due to the ECB meeting yesterday. This pair indicated a 0.2% fall at the end of February by CPI. 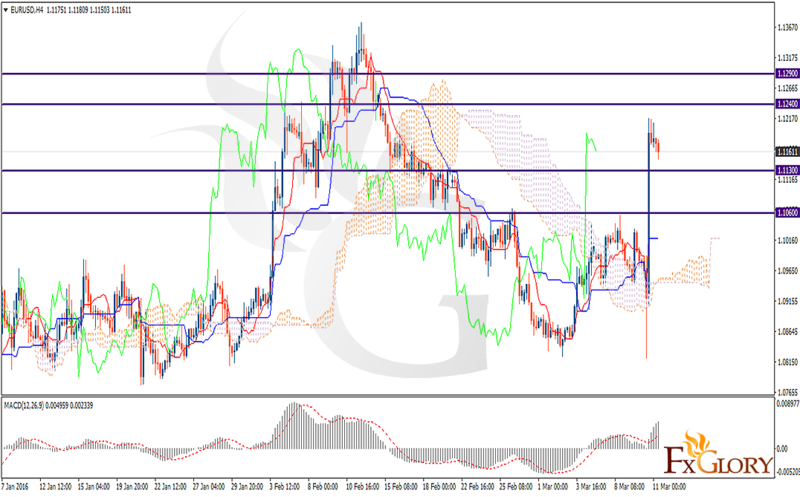 In this H4 chart, the support levels lie at 1.1130 followed by 1.1060 with the resistance of 1.1240 and 1.1290. The price is above the Ichimoku Cloud and the chinkou Span which signals a perfect chance for buyers. While Kijun-sen shows a horizontal movement, the Tenkan-sen displays an upward trend which will continue until the pair reaches the price above the cloud. Not only the Ichimoku indicator is signaling the price growth but also the MACD is in the positive territory which confirms the Ichimoku signal. Buyers can target 1.1240 and 1.1290 while there is a bounce chance at 1.1060 after which the pair will continue its upward trend though such kind of harsh jumping which based on NEWS could have a retrace and test some Fibo levels before further rise.